The Analyze IQ software suite enables you to interrogate of all types of spectroscopic data automatically and organise your data effectively, to streamline your decision making. This gives you a competitive edge, minimizing errors and reducing costs. Our software has been designed to address the need for accurate analysis of spectroscopic data in complex, real-world situations. It is used with all forms of spectral data, including data from spectroscopic techniques such as infra-red (IR), near infra-red (NIR), Fourier transform IR (FT-IR), Raman, x-ray fluorescence (XRF), Mass Spectrometry, LIBS, SERS, and others. We have introduced a new model-driven paradigm for spectral data analysis, which allows fast, accurate and automatic analysis of spectra. Our approach designed to avoid the limitations of conventional techniques such as direct-matching against databases and spectral subtraction, since such techniques are complex and error-prone, and can only identify limited numbers components. Are designed to minimise risk of errors when building models or performing analyses. Analyze IQ Spectra Manager: Recognising that your spectra are valuable assets, Spectra Manager makes it easy for you to store and organize the spectra and related meta-data. It’s an ideal alternative to the high cost and effort if implementing a LIMS, or the all-too-common approach of keeping spectra in spreadsheets or folders, where associated information and context are lost. 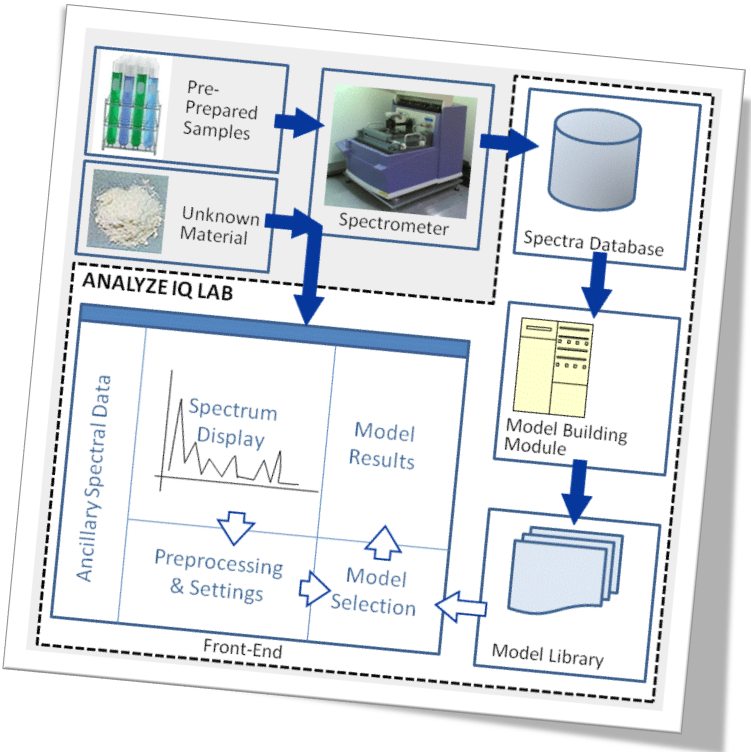 Spectra Manager integrates with Analyze IQ Lab, so that you can easily select appropriate spectra from which to build Analyze IQ models. Analyze IQ Raman Library, a carefully-curated library of approximately 2000 Raman spectra, including the exact composition of each material and all associated data. Analyze IQ RealTime: allows you to ‘package and deploy’ expert knowledge, since chemometric models that have been constructed and validated by expert analysts can be deployed in fielded applications, where they can be applied automatically or by end-users without chemometric training for automatic processing in real time. Services: The software suite forms a platform for the company’s other services, including producing bespoke models for specific applications, and developing customized software solutions for vertical markets. Pharmaceutical: Analyze IQ is applicable in a diverse range of analytical area from raw materials quality control (QC), formulation QC, tablet production, polymorph analysis, and characterisation of hazardous materials. Process Analytical Technologies: Analyze IQ can be used for quality control in process monitoring, and for monitoring of waste streams. Forensics: Drug concentration is useful intelligence that indicates where on the ‘supply chain’ a narcotics seizure has originated. By being able to identify the diluting agents, more intelligence can be provided to law enforcement agencies. First Responders: Analyze IQ can aid the identification of household poisons, unlabelled medicines, and hazardous materials, in combination with portable instrumentation. Environmental: Raman instruments, in conjunction with Analyze IQ, can be used to identify unknown chemicals and other materials, and determine the concentrations of components. Preprocessing methods include: Data smoothing; Derivatives using Savitzky-Golay method; Normalization; Standard Normal Variate Transformation; Equal Area Scaling; Truncation with Crop and Notch Options.